Road safety has always been a concern. With Dylan’s inability to foresee the danger in cars or negotiate traffic the lack of road safety has been one of the biggest blockers to Dylan’s developing independence. Today we went to town and negotiated a total of 10 pedestrian crossings. The type of crossings where you press the button and the traffic lights turn red to stop the flow of cars and the green man lights up to indicate it is safe for pedestrians to cross. Now these crossings are tricky for Dylan. Often he can see both the road light and the crossing man light so to indicate to Dylan which one he actually needs to be paying attention to is a difficult feat. The common saying ‘green means go’ has a different outcome if you are a pedestrian applying the rule to the green road light for cars. In addition to the confusion of which light to watch, Dylan Also has such strong imitation skills that even when he knows that he should be waiting on the kerbside for the light to change if he sees other members of the public brush past him to cross the road he can often think this is an indicator for him to follow suit. The results of him stepping out into flowing traffic could be disastrous. 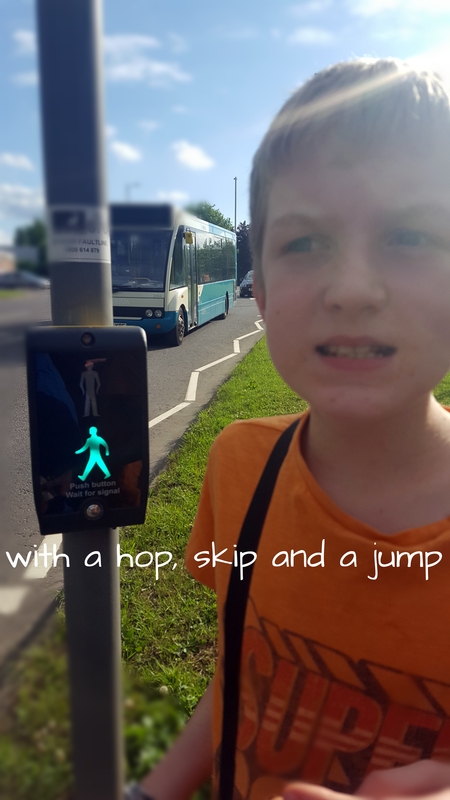 So to practice developing this skill we stop at each and every set of traffic lights, Dylan presses the button and I say to him straight away. When Dylan gives the ‘yah’ we cross the road. I told him at the last set of lights how well he was doing keeping us all safe across the road and he took a moment off from his duty to pose so proudly for a picture just as the lights changed.